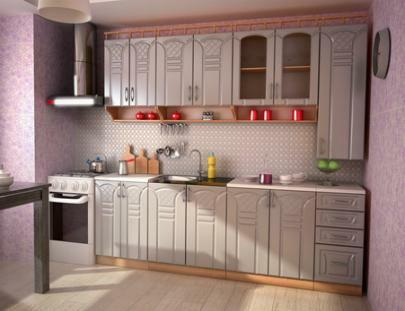 Kitchen "Karina" from the furniture factory "Mizan" is made from environmentally friendly materials. The case of a chipboard of 16 mm, facades of kitchen furniture are made from qualitative MDF. Always available in various colors of facades. Kitchen furniture "Karina" is made as in the standard version (2.0-2.6 m), it can be recruited section by section, which allows you to equip a kitchen of any size. All the lower elements of the kitchen furniture are installed on the legs, which simplifies adjustment when installing the kitchen and protects the bottom of the kitchen from moisture. The tabletop can be both in sections, and common!